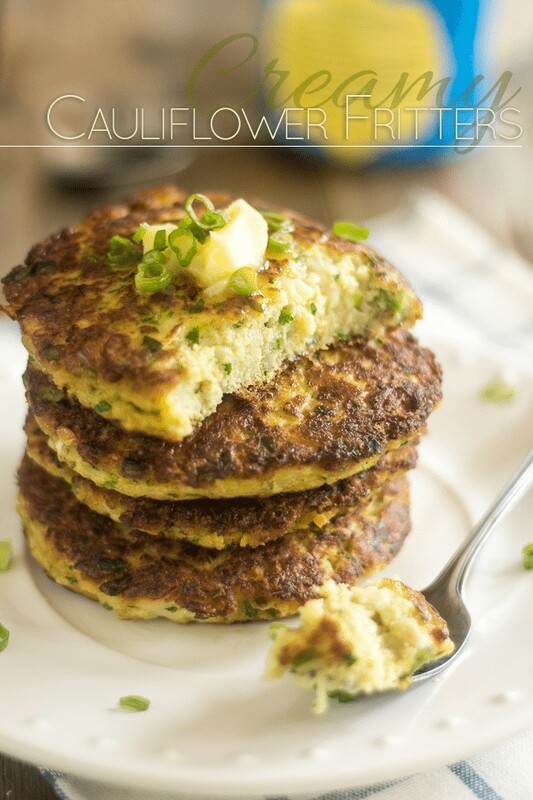 For the longest time now, I’ve had Cauliflower Fritters on my list of upcoming recipes. In fact, what I really meant to do was revisit this old Cauliflower Fritter recipe of mine, which I came up with a little over 2 years ago. I’d always been curious to give them another try and perhaps improve them a little bit. 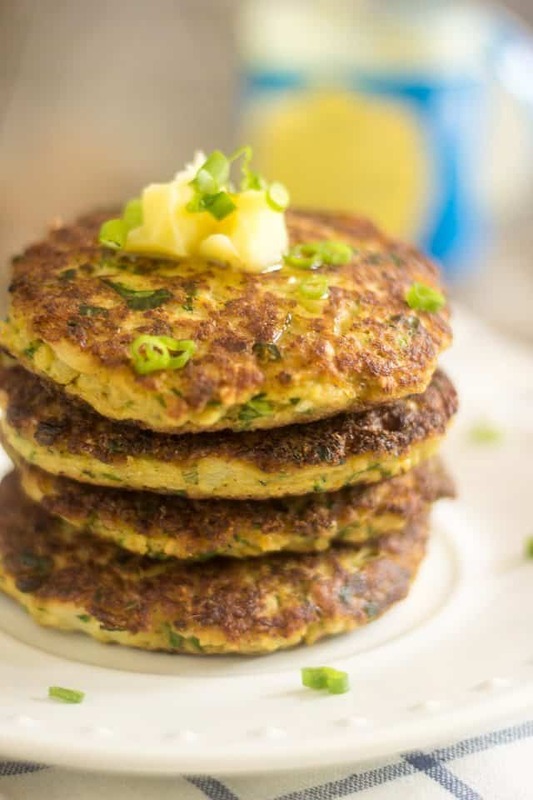 But then, some unknown blogger, you know, some guy whose blog I had never seen, let alone read before in my life, had to go and post HIS version of Cauliflower Fritters. I was doomed, finished, done for. From the moment I laid eyes on those fritters, I knew I would know no rest until I’d sunk my teeth into some extremely similar fare. That creaminess, that lusciousness over which my eyes were getting all excited, my mouth was eagerly demanding. The revisiting of my old recipe would have to wait. This new version was going to have to happen first. And frankly, now that I’ve had a try of these, I’m not even sure that I want to revisit that old recipe of mine. I think I’m gonna have to come up with a cross between the “then” and “now” fritters. Unfortunately, there’s [almost] no making cauliflower anything without well, cooking the cauliflower first, and then squeezing the water out of it. And we all know how much I like to squeeze water out of things, don’t we? Just make sure you cook that cauliflower until it’s REALLY soft and tender. This is now my rig of choice for squeezing water out of things. I found a bowl that fits very snuggly inside my sieve, so I use it to push down on whatever I want to extract water from and it works wonders! If you don’t have such a bowl, you could also use a ladle, or a small unbreakable plate. And if you don’t have a fine mesh sieve, you could also use the tea towel method: just dump your cooked cauliflower onto a clean tea towel, wrap it up and squeeze the bejesus out of it. Again, whichever method you choose to use, make sure you squeeze every last drop of water out of that cauliflower. I can guarantee you that even when you think there’s no more, there’s still some. So grab a spoon, break down the florets and move them around a little bit and squeeze some more. Do that 2 or 3 times. You want to be certain that your cauliflower is absolutely, positively dry. Don’t stop squeezing until there isn’t a single drop of liquid coming out. Phew. Glad that part’s done with. Now we must simply mix all the ingredients together in a bowl, then form the mixture into 4 patties. You could also do 8 smaller patties, if you wanted to, but I wanted nice big patties! 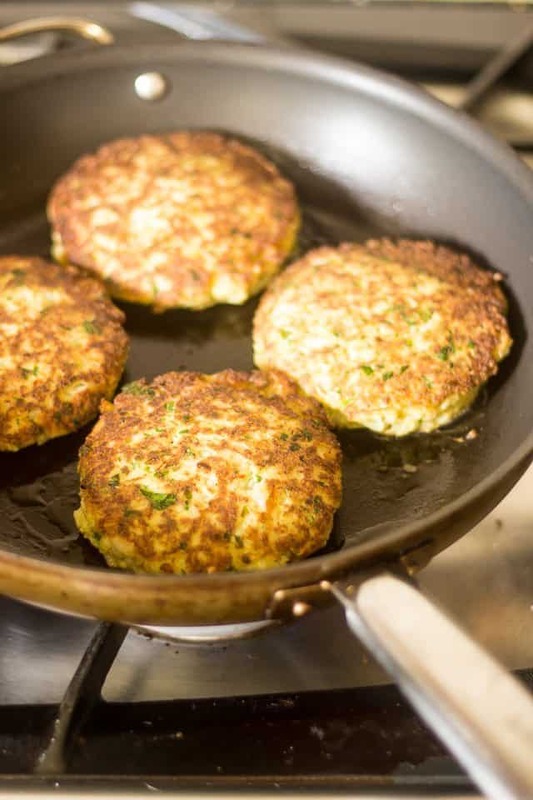 Cook the patties in a large skillet set over medium heat, for about 3 to 4 minutes per side. Now these are fairly delicate, so you don’t want to be moving them around. Plus, you want that nice golden caramelization to happen, right? Right! That only happens if you leave food alone. So set them in that pan and let the hot fat do its work. When you can see that a nice golden crust has formed, delicately flip the patties over and give them another few minutes to form an equally beautiful crust on the other side. Serve these beauties piping hot, topped with a little dollop of ghee and a few rings of chopped green onions. Just look at that gorgeous melting butter that’s slowly making its way down the pile of creamy golden fritters. OH! Be still my heart. But that’s not all… just wait ’til you see how creamy these are on the interior… Unbelievable! See? Oh my! Creamy enough for you? I’m telling you, the contrast between that crispy, tasty golden crust and the smooth, buttery interior is absolutely out of this world! It’ll quite simply blow your mind! Make these now… they’re worth all the water squeezing efforts, I swear. 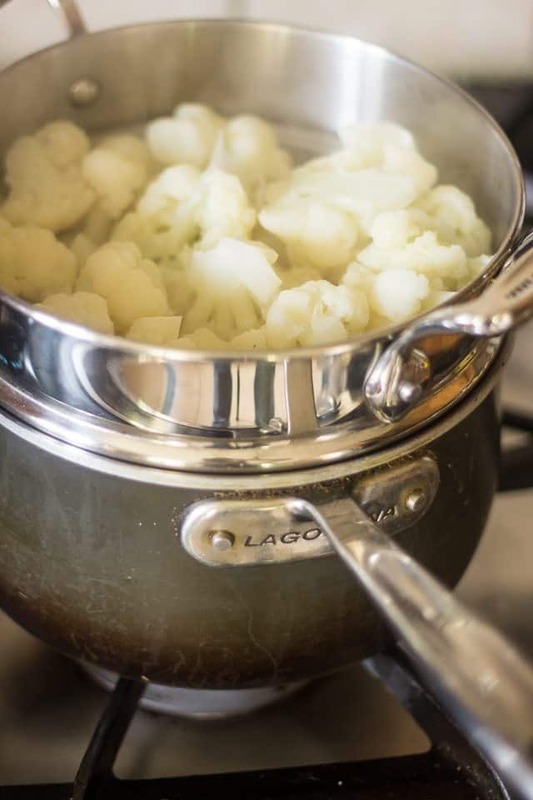 Steam the cauliflower florets over salted boiling water until really tender, about 8 to 10 minutes. 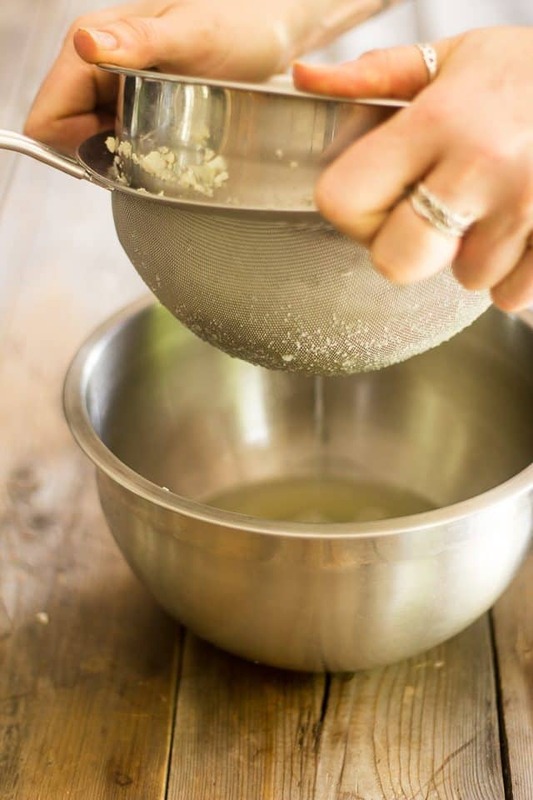 Place the cooked cauliflower in a fine mesh sieve* and press it down real hard with a ladle or an unbreakable bowl or plate that fits snugly into the sieve; You need to remove as much water as you possibly can, so don’t be afraid to squeeze. Even when you think the water is all gone, I can guarantee you there's more! Move your cauliflower around with a spoon and break it down to smaller pieces, then squeeze again. Repeat until no liquid comes out: you want that cauliflower to be DRY! 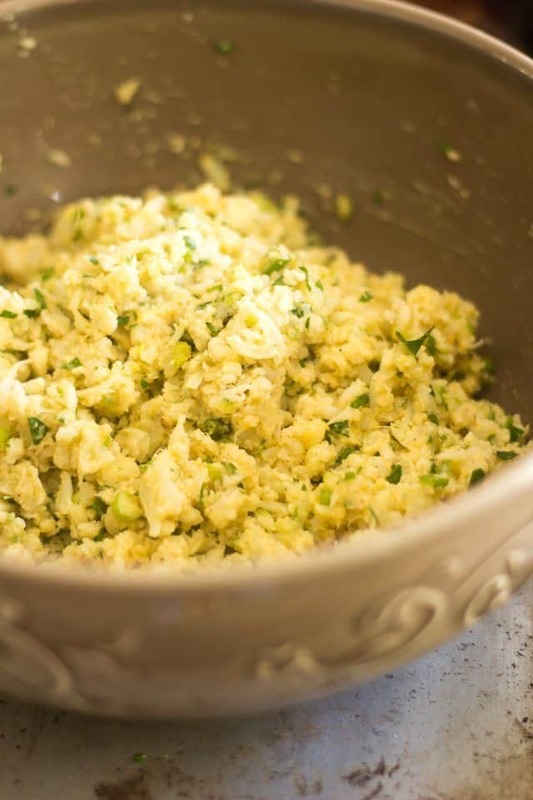 Transfer the cauliflower into a bowl, along with the rest of the ingredients, except for ghee. Mix by hand until all the ingredients are well combined then form into 4 patties. Melt the ghee in a large skillet set over medium heat. When the pan is hot enough, delicately add the patties and cook undisturbed until a nice golden crust forms, about 3-4 minutes per side. Serve piping hot with a little dollop of ghee and chopped green onions. 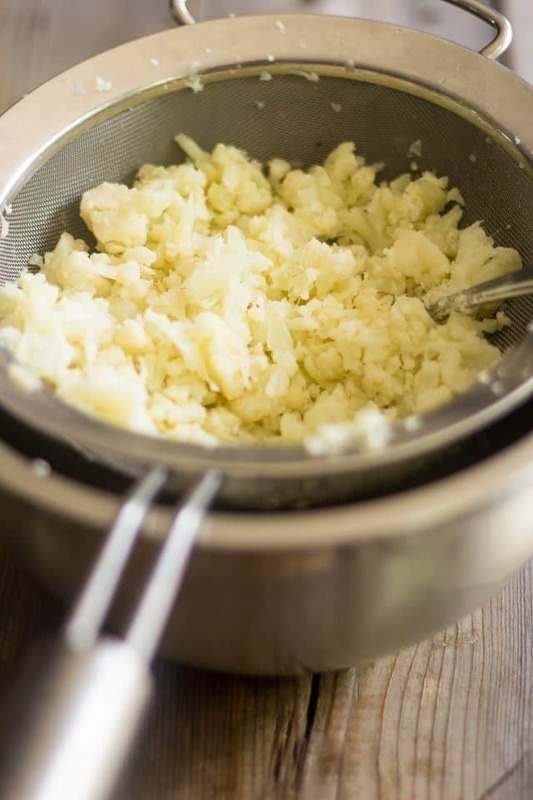 *If you don’t have a fine mesh sieve, you could also dump the cauliflower onto a clean tea towel, wrap it up and squeeze the heck out of it. 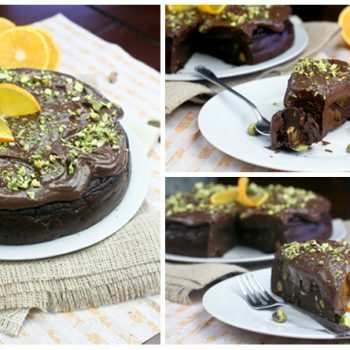 O_O These look even more exceptional that your usual fantastic recipes! And you know I loves me some cauliflower! 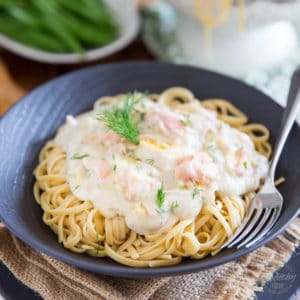 Can’t wait to try this recipe out – like TODAY! These look amazing Sonia!! Any suggesstions/options for a substitute on the eggs and almond flour if someone wanted to make them AIP friendly? Flaxseed eggs and coconut flour, maybe? Would these work? I’m sorry, I’m not really familiar with AIP… maybe I oughta research that condition a little more! These look so amazing! 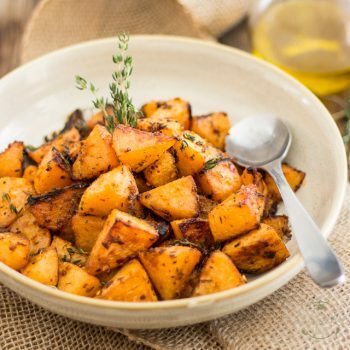 What a perfect side dish to any meal! Thanks much, Ashley. And you got that right. These go good with just about anything! Looks good. I always have to find ways to teach my kids to eat healthy. Can be a challenge sometimes. How funny! I just made some cauliflower fritters last week and started following your blog after a search led me to your old recipe. 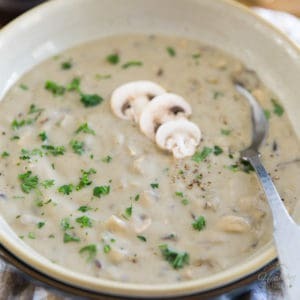 I didn’t have all the ingredients for your old recipe but ended up making them very similar to this one. I like to use a box grater and grate on the very fine side and squeeze very well. I find I don’t even have to cook the cauliflower. I also added a couple tablespoons of coconut milk and I topped mine like an everything bagel- with poppy seeds, sesame seeds, dehydrated onion, dehydrated garlic, and salt. Super creamy and tasty for breakfast! I’m not usually a huge fan of steaming, because I don’t want the nutrients to leach out into the water. 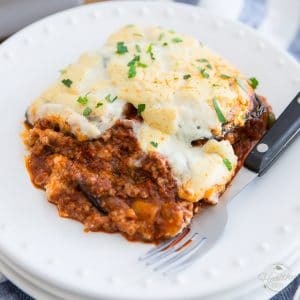 Do you think roasting the cauliflower would work okay for this? 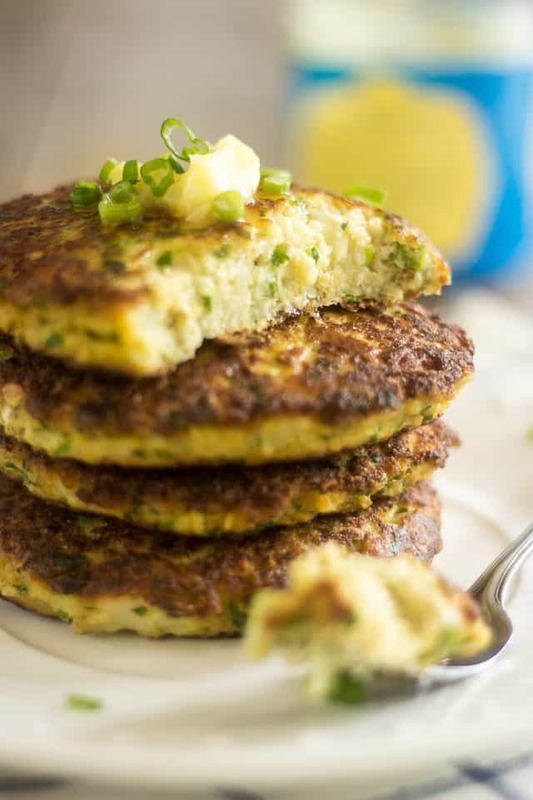 Have been dying to make some kind of non-meat patty/fritter, and these look terrific! Tried it tonight! We got six burger-sized patties. My husband ate 3 of them. 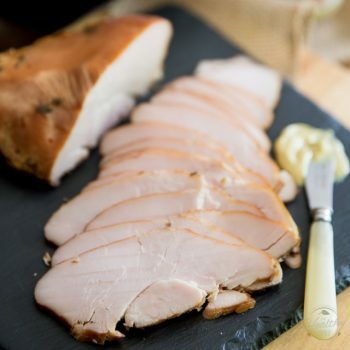 Yummy – thanks for the recipe! BTW those fritters look amazing, I could use a couple today for lunch! 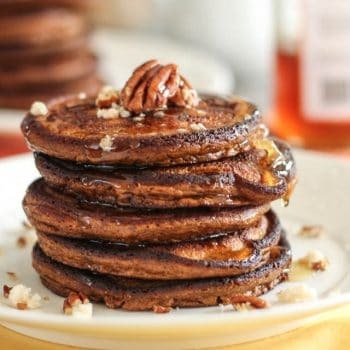 Do you think it’s possible to make these without any flour? I’m allergic to everything. Probably… can you do flax seed meal? I think that could be a good replacement! If not, I suppose you could just leave out the flour entirely and perhaps add an extra egg, just to be on the safe side and help the fritters hold their shape. No seeds, no nuts, no grains, no legumes, very limited starch. 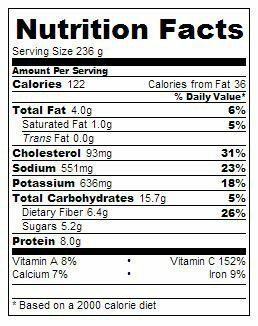 The only thing I can eat that would absorb moisture is cinnamon, and of course I can only use so much of that in a recipe. I’ll try it with an extra egg. Thanks! Yikes, that leaves A LOT of very good options out! And erm… no, I don’t think I would do that much cinnamon, especially not in this recipe. I mean I like the stuff, but there’s limits! 😉 Hopefully the extra egg will do the trick… Let me know, if you end up trying it. I’m not sure I understand the reasons behind squeezing the water out of cauliflower in this recipe. 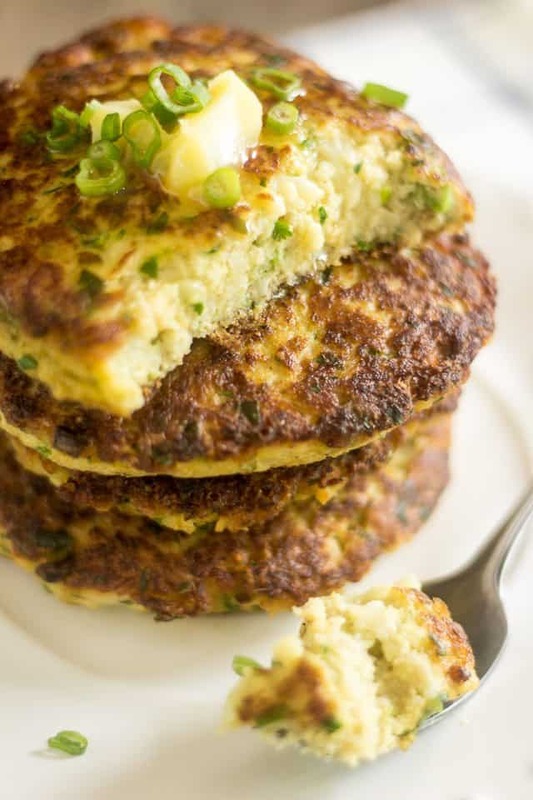 I make similar patties (though we call them burgers LOL) with leftover roasted cauliflower. In fact, we love them so much that I usually roast much more cauliflower than we could possibly eat just to have some for the next day. So, I use onion, parsley, garlic, finely chopped hazelnuts and chili, and as a flour of choice – besan. 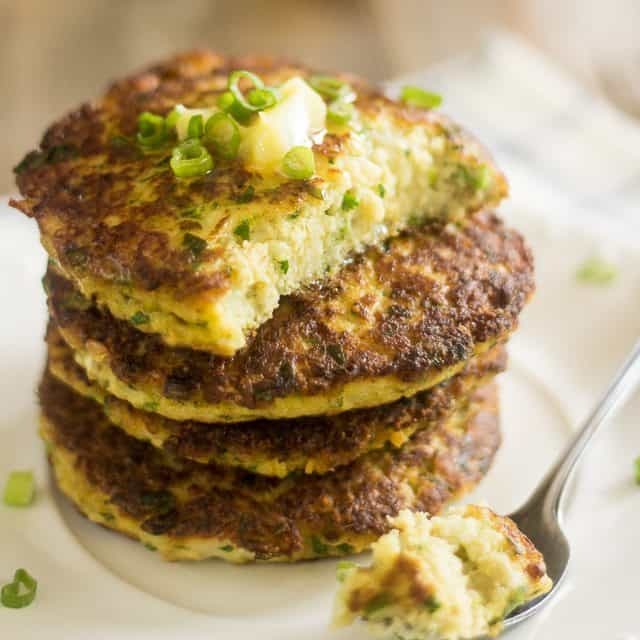 I don’t measure the ingredients, just mash the cauliflower with the fork, add the rest of ingredients and as much chickpea flour as needed to form “patties”. 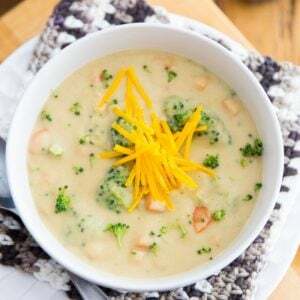 I sometimes add a bit of coconut milk. I DON’T, HOWEVER, ADD ANY EGGS since my hubby is allergic to them. The patties come out super soft and creamy inside and crusty on the outside. We usually eat them with cucumber mint raita as a light evening dish. If there are any left for the next day, I take them to work as lunch and eat them in a burger bun with sriracha and lettuce. I wonder if you need to make the cauliflower dry first, so you can use eggs as a binding ingredient and in fact make the mixture moist again. I’m not sure it makes any sense (what I wrote, not what you created in the recipe). I’m painfully with you when it comes to squeezing water out of anything (I make my own soy milk, go figure). Funnily, when it comes to visual side, my cauliflower patties look pretty much the same to yours, maybe a bit darker (from roasting of course). These were delicious! My husband, the meat and potatoes eater, loved them also. By the way, I decided to use my juicer to “squeeze” the water out of the cauliflower. It worked beautifully. No work at all. The cauliflower pulp comes out very dry and works nicely in the recipe. The juice is loaded with nutrients, so you may want to use it or add another juice to make it more palatable, although it actually has a very mild flavor and sweetness to it already. Great tip, Natalie! Thanks for that, and glad the recipe was to your liking!